RPGToddler recently turned three. She has been coming up with great names for her imaginary friends (they are “Made of pretend”) for well over a year. Yesterday she told me, “Daddy, this is Sassy.” “Sassy?” I asked. “No, Sanse.” And then she spelled it for me “S A N S E” I have no idea how she figured out the spelling on her own, but do not be surprised when Sanse ends up Dean of the Pedagogues guild. The clanging of alarm bells caused Leopold and Atila to leap from their bed, scrambling for the weapons carefully arrayed nearby. With no immediate threat in sight, they hurriedly dressed. Making their way to the bridge, they passed other groggy crew members stumbling to their own battle stations. Leopold gave a quick prayer of thanks when he found the bridge alert and ready. His helmsman stood and saluted as Leopold and Atila entered, and the two officers took their customary positions as he gave his report. Leopold cursed the loss of initiative. He could flee, hoping to return to fight another day, but the thought galled him. His plan has as much chance to work in the depths of space as it did over Dalian. A quick check showed that the Mane was ready, and the two vessels set forth with the explorer slightly ahead of the Pride. The Decados ships slightly altered their course to keep their own explorers between the Hawkwood and their galliot, removing any doubt that they were aware of Leopold’s ships. Often this stage before a battle would turn into a ballet of maneuvering, with each side trying to bring their own broadside to bear without entering the other side’s field of fire. Leopold began the dance, but it quickly became apparent that the Decados were more interested in the same strategy he had used to conquer the frigate. No matter how the Hawkwood twisted and turned, the Decados sped toward them, the explorers using their maneuver jets to stay in the middle. Finally Leopold gave up on the intricate positioning and sped forward, determined to enact his original strategy. Even with the two fleets barreling toward each other, it took several hours for them to cross the intervening depths of space. Leopold and his officers took that time to inspect the new crew, checking their readiness and steadying nerves where needed. Still, Leopold could feel his own anxiousness rise along with his crew’s, and it was a relief when the enemy finally closed to within the range where his lasers could hit. He gave the order to the Mane, and the first shots tore through the dark. The enemy shields lit up with the energy, but Leopold saw no sign they had penetrated. He ordered the Pride to turn and apply counterthrust as the Mane sped on. It continued to fire its lasers as it came within range of the Decados explorers. They let loose with their own blasters, and the effect was immediate. The Mane sparked at the impact, and at least one of its lasers failed to fire during its next salvo. As the Mane continued on its way, the explorers turned their attention from it to the oncoming frigate. Their initial shots did not penetrate his shields, and the Pride turned to bring its broadsides to bear. Blaster after blaster blazed forth, and both Decados explorers suffered from the onslaught. Damaged, they moved behind him and both fired on his aft shields. The combined barrage did break through, and damage reports came through of engines in flames. This did little to worry Leopold, for he felt they had enough momentum now to engage the galliot. Then he saw it maneuver after the Mane. The Galliot carried less weapons than the frigate, but it was better armed then the now-damaged explorer. When it opened fire, its blaster shots tore through the weakened shields. The Mane accelerated as fast as it could, desperate to avoid another broadside. Leopold’s concern for his comrades on board the stricken ship was tempered by his delight at the proffered opportunity. By focusing on the small explorer, it gave him extra time to deal with the smaller Decados ships. Shot after shot pounded the little explorers, quickly crippling one and leaving the other barely able to maneuver. Now all the Hawkwood had to do was maneuver away from the galliot, and their superior guns would make this a short battle. The Pride began turning to avoid the galliot, now speeding toward it again. “Leo!” Atila called out. “Our starboard maneuver jets aren’t responding.” At the same time, one of Leopold’s Hawkwood loyalists, a crewman who had sailed with him for years, burst onto the bridge. Then sounds of an explosion rocked the ship. “That was the jets,” Atila said grimly. “Get down there,” Leopold ordered. “Grab what marines you can and stop them.” Atila did not hesitate. She grabbed the crewman who had just come in, beckoned two marines stationed on the bridge, and ran off toward the explosion. Now Leopold knew how the Decados had become aware of them. Traitors among the smugglers must have contacted them, setting a beacon and sabotaging the ship. Unable to escape the oncoming ship, the Pride would be boarded and retaken. Leopold had no idea when or how the Decados had arranged this with the smugglers, but now that was the least of his concerns. Since he could not avoid being boarded, he had only one chance – blast the Decados again and again, killing enough marines to give his force a chance. As the Decados ship entered range of his blasters, he gave the order. Superheated plasma tore through the vacuum of space, lighting up and tearing through the galliot’s shields. On it came, and as soon as the blasters recharged, they fired again. Three times they fired, and three times they hit. Gaping holes appeared in the galliot’s hull, spewing debris and bodies into the void. Now it was the galliot’s turn to fire its guns, only this time they fired grappling lines instead of energy pulses. They latched onto the Pride with a fury. The two ships shuddered as their competing momentums countered each others progress, bringing both practically to a stop. With the galliot too close to safely attack, Leopold ordered all his marines to their stations as he desperately struggled to break free of the tethers. Explosions again rocked the ship, and Leopold knew that their hull was now breached. He longed to be in the midst of the melee, Atila at his side as they carved their way through enemy marines. With Tomas on the Mane, however, he trusted no one else to fly the frigate. Firing what jets and engines still responded, he knew that with time he could free the frigate and again bring his guns to bear against the enemy. He just had no idea if he would get the time. In the distance he could hear shots ring out. He cursed those who would take such a risk on this ship. The next shot sounded closer, and he redoubled his efforts. The marines still on the bridge unsheathed their blades and faced the door. Just before Leopold could free the Pride, the bridge door again burst open. This time the green-clad troops of the Decados poured through. The Hawkwood bridge marines were good, the best on the ship, and they swung immediately into action. The first two Decados through the door fell, hacked down as they entered the bridge, but more poured through after them. Soon all the bridge marines were engaged in a swirling melee. One of the Decados raced across the bridge at Leopold. Drawing his own sword, Leopold cursed as he interrupted his efforts to free the Pride. He parried a swing from the Decados’ cutlass, riposting with a thrust that went right into his enemy’s breast. A second marine came at him. Leopold found himself hard pressed by this one’s savage assault. Finally he let his shield bear the brunt of the assault while he carefully drove home his own blade. As this second Decados slid to the floor, a cutlass blade sliced toward his head. Leopold had no time to duck or parry. The full force of the blow came toward his eyes, connecting with a flash and a loud “Pop!” The flash told him his shield had activated, but the pop told him the powerful impact had overloaded his only defense. The realization that, for the first time in years, no shield kept him safe focused his attention as never before. His rapier became a wall of steel between himself and his new foe, a towering marine wielding his cutlass like a club. The clash of blade on blade echoed in his ears, drowning out all the other desperate sounds of battle. All the other foes disappeared behind this one mountainous obstacle. Leopold’s own thrusts and slices slipped by his enemy’s perfunctory defenses, but the scratches and cuts slowed his massive foe not at all. Each wild swing of the cutlass came closer and closer to Leopold’s head before he could block it. Finally the Hawkwood changed his tactics, targeting his enemy’s hand rather than his heart. With a parry and a desperate twist, he tore the cutlass from the Decados’ hand. Drawing back, he plunged the rapier into his surprised enemy’s throat, and the marine finally collapsed. Leopold’s attention returned to the carnage around him. His marines still held the bridge, but at least half had fallen to the Decados onslaught. Outside the battered doorway Leopold heard another commotion, and another Decados appeared. This one raised a hand, holding a slug gun aimed right at the Hawkwood’s head. The flash of a blade tore through that hand. The blade continued into the surprised face of the Decados, and Atila appeared in the doorway. Leopold screamed her name. She smiled grimly at him, mouthed something, and leapt back into the fray. Fighting back his desire to rush to her side, Leopold returned to the ship controls. Now feeling as protected as if his shield still worked, he confidently pushed buttons and worked levers to free them from the galliot’s deathly clutches. Stealing a glance at the view screen, bursts of light startled him. Laser beams were cutting into the galliot, and Leopold realized Tomas had returned as well. The little explorer could not do much, but its assault proved just enough. Leopold accelerated once more, and this time he felt the ship wrench forward. The grappling lines broke, and the Pride leapt free. Decados marines, still making their way across, went spinning into the void. The galliot restarted its own engines. Its captain knew not enough marines had boarded the Pride to capture it. The Decados, desperate to again close the distance and send the last of their marines over to the frigate, spun the ship around so its mauled fore faced the Pride. Leopold gave the order to fire. Not all the guns responded, but enough did to tear even more wounds in his foe. The galliot poured on the power, but it had already suffered too much damage. Every salvo ripped through it, now as unprotected as Leopold without his shield. Soon it became apparent that the galliot’s own bridge had been hit, leaving it out of control. As Atila and the Hawkwood marines finally overcame the boarders, Leopold ordered the surviving crew of the galliot to surrender. It was not hard to locate the Decados vessels. They stayed close together as they orbited Dalian, raining down destruction wherever they pleased. What few radio broadcasts still emanated from the planet gave evidence of Decados brutality. 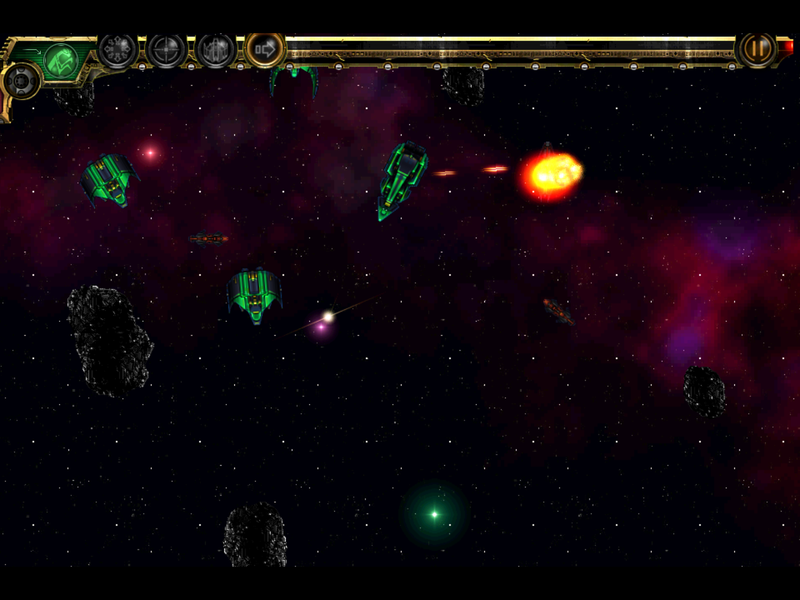 Even without the frigate as part of its orbital blockade, the Decados continued to shoot down any craft that tried to take flight. Dalian’s few power stations, military bases, transportation depots, harbors and even hospitals had all suffered at their hands. The Decados continually broadcast demands for the planet’s surrender. Some of the planet’s leaders had already offered to surrender, and the holdouts were clearly wavering. Tomas tracked the Decados ships’ broadcasts, and the Hawkwood vessels set sail from Opal. Atila wanted more time to familiarize the crew with the frigate’s guns and capabilities, but Leopold feared that Dalian might fall at any time. In the space between the two worlds his crew spent a day practicing the maneuvers required to bring them victory. Leopold himself piloted the frigate in place of his old friend, and he quickly came to long for Tomas’ hands at the controls. He lacked Tomas’ years of Charioteer training, and it showed. His growing realization of his own failings ate at him. The harder he tried, and the harder he gripped the controls, the more his hand began to quiver under the strain. Still, he trusted no one other than Tomas to command the explorer. While he trusted the smugglers enough in combat against the Decados, he had no reason to believe they would not turn on him once the fight was through. In any case, the smugglers lacked experience in ship-to-ship combat. This fight would require a sure hand at the helm of both ships. Finally Leopold called a halt to their training. His hand was by no means the surest, but at least it had stopped shaking. He ordered the two ships to dock together, and brought both crews on board the Pride. His hand almost started shaking again as he saw them try to line up at attention. The odd assortment of Hawkwood veterans, miners and smugglers made a bizarre mix. While all had reason to hate the Decados, only the miners were truly committed to this battle. Their friends in the distant reaches of the solar system required the Decados siege end. While some of Leopold’s Hawkwood veterans had lost friends and family to the Decados during the Emperor Wars, that was years ago. Leopold and his friends could easily return to Hawkwood space, richer by a frigate. Since the Decados attacked him first, he could keep his prize. Selling it would enrich all his crew, some far beyond what they had ever had before. Still, he saw their faces and knew the resolve that showed though. While some no doubt hoped for even greater riches, most were putting their lives on the line to help the unknown people of Dalian. The smugglers were the unknown factor. While the Decados blockade had halted their livelihood, the siege would not last much longer. Surely they could resume their illegal activities once Dalian surrendered. All the same, Leopold required their technical skills. The frigate required far more crew members than had his explorer, and several of his more experienced followers had suffered injuries in the last fight. Reliable or not, he needed the smugglers. The traditional Hawkwood speech before a battle was a call to honor and duty, a reminder that principles mattered more than life itself. It also stressed the crew members’ loyalty to one another, but Leopold was not sure that would resonate with this myriad bunch. Instead he took a new tact, reaching back into humanity’s distant past for the climax of his speech. “For hundreds of years Dalian has been separated from the rest of humanity, alone in the darkness of space. Your people have fought and scraped to maintain these worlds, no doubt fending off crises that could have left you on the edge of disaster. Now the jumpgate has reopened, and the heavens can be yours again. But you see before you the best and worst that the Known Worlds have to offer. On one hand is the very threat that caused so many worlds to close their gates – cruel raiders who would take everything for themselves, tearing down what it has taken generations to build. It’s easy to want to hide, hoping that they will take what they want and leave. But that is never the case. With every taste of success the raiders return, demanding more and more. “On the other hand is the questing spirit of our people, anxious to reunite all the Lost Worlds. This is not for personal wealth or even glory, though I certainly hope we all share such. This is for the benefit of all people, warrior and worker alike. Humans do not prosper isolated and alone. We thrive together, sharing the sacrifices and rewards alike. The jumpgate is open again, and more ships will fly through it. They will bring riches long unseen here, seeking to trade for Dalian’s forgotten treasures. Everyone in this room will benefit from that commerce, as will everyone on the planets from which you come. “Tomorrow’s fight is for far more than wealth and the rule of one system. Should the Decados win, all the wealth of Dalian flows into the coffers of the nobles who have bombarded your worlds. Some locals, those willing to do the Decados bidding, will prosper. All the others suffer, as do the rest of the Known Worlds. We lose all the benefits that come with your growth and prosperity. “Should we win, we will not own Dalian. Its wealth will not become ours. We expect rewards, but we will not rule. Dalian will join the Known Worlds beholden to no one else. Its wealth will strengthen all humanity, and the strength of humanity shall flow to it. Our victory tomorrow is not just for ourselves. It is not just for Dalian.” With that Leopold drew his rapier. “It is for a humanity that shares its risks and rewards, its tragedies and triumphs, its fears and its hopes. Alone, we all shake in the dark. Together, we are as my blade. All humanity is the weight of this sword. We are its razor-sharp point, ready to drive our way through Decados hearts!” Leopold ended his speech with a flourish of his sword that brought cheers from all the members of his far-flung crew. He then dismissed all but a skeleton crew, recommending that the rest get a good cycle’s sleep in preparation for the battle to come.